9415 on National farewell tour, at Vancouver, British Columbia. C-GVMH in a farmer's field, 20 miles north of Edmonton, Alberta. C-GVMH back on solid ground. C-GVTO (1) at Victoria - CYYJ, British Columbia. 4R-ARB doing duty in Sri Lanka. C-FJHA images at Victoria Harbour. C-FJHA images at Vancouver's Coal Harbour. C-FJHA over at Victoria Harbour this time. • 9415 Royal Canadian Air Force.31-Oct-1960. Designated CSR-123. Initially allocated to 402 Squadron, Winnipeg, MB. Jan 1961. Passed to 406 Squadron, Saskatoon SK. Mar-1964 Returned to 402 Squadron, Winnipeg. MB. Oct-1965 Withdrawn from the squadron, and allocated as a reserve aircraft for service with 117th Air Transport Unit (ATU) in Pakistan. 17-Feb-1966. Assigned to 411 Squadron, Downsview, ON. Accident: Buttonville Airport, Toronto, ON. 22-Oct-1966 On touchdown after a full flap approach, the right wing rose. Corrective action was ineffective, the left wing tip touched the ground, the aircraft yawed to the left, the tail rose and the aircraft came to rest off the runway in a nose-down attitude.. As well as the left wing tip, there was also damage to the propeller and undercarriage. 03-Dec-1981. Ferried to CFB Mountain View, ON., and put into storage. Sep-1982.Sold by the Crown Assets Disposal Corporation at auction. Entries preceded by date are extracts from Canadian Department of Transport archives. 24-Sep-1982 temporary Certificate of Registration issued to Mike Hackman Aircraft Sales Ltd., valid to 24-Dec-1982. 28-Oct-1982 Crown Assets Disposal Corporation invoice for an Otter at the AMDU Detachment, Mountain View ON to Mike Hackman. 22-Nov-1982 Allotment of C-GVMH to DHC-3 msn 393 for Mike Hackman Aircraft Sales Ltd., Edmonton AB (presumably reserved earlier). • C-GVMH Mike Hackman Aircraft Sales Ltd., Edmonton, AB. Regd 22-Nov-1982. 25-Nov-1982 A ferry permit was issued for a flight from Belleville, Ontario to Edmonton. 24-Jan-1983 Temporary Certificate of Registration issued to Mike Hackman Aircraft Sales Ltd., valid to 24-Feb-1983. __Feb-1983 application for Certificate of Registration by Estabrook Constriction Ltd., Grimshaw, AB. __Jun-1983 Certificate of Airworthiness issued. 15-Jun-1983 Bill of Sale; Mike Hackman Aircraft Sales Ltd to Estabrook Construction Ltd., Grimshaw, AB. • C-GVMH Estabrook Construction Ltd., Grimshaw, AB. Regd circa-Jun-1983. Canx 06-Jul-1983. 06-Apr-1984 Flight Permit for test flight issued to Estabrook Construction Ltd., valid to 06-May-1984. 20-Jun-1984 Bill of Sale; Estabrook Construction Ltd to Mike Hackman, Edmonton ,AB. 20-Jul-1984 Flight Permit for Certificate of Airworthiness test flight to Estabrook Construction Ltd.
26-Jul-1984 Certificate of Airworthiness issued. 26-Jul-1984 Certificate of Registration issued to Mike W. Hackman, Edmonton, AB. • C-GVMH Mike W. Hackman, Edmonton, AB. Regd 26-Jul-1984..
11-Oct-1984 Temporary Certificate of Registration issued to Mike W. Hackman, valid to 11-Nov-1984. 23-Oct-1984 Bill of Sale; Mike Hackman to Hub Air Service Inc., McGrath, AK. Note only 3 hours since sold by RCAF. • N61LC Hub Air Service Inc., McGrath AK. Regd 24-Oct-1984. Accident: Fifty five miles north east of Wrangell. 22nd November 1987 On final approach, the pilot was distracted while observing fresh animal tracks in the snow below, and did not notice that the aircraft's angle of descent was getting steeper and that the airspeed was decreasing. When the pilot recognized what was happening, he applied power and pumped the flap handle, thinking he was raising the flaps. However, as the flap selector was down, he inadvertently lowered the flaps even more. The increased drag from the lowered flaps prevented the aircraft from recovering, and it struck the ground short of the runway. The landing gear collapsed and he aircraft was substantially damaged. • N61LC David A. Werner, dba Diamond Aviation, Cordova, AK. Based Wrangell, AK. Regd 14-Aug-1987.Canx 15-Mar-2001. • C-GVTO 524085 BC Ltd. Regd 22-Mar-2001. Canx 30-Apr-2004. Power plant. Converted to Vazar turbine by Viking Air, Victoria, BC. Note: Purchased by Trans Maldivian Airways but although delivered to Malé, Maldives, was not registered and was immediately sold on to Sri Lankan Airlines. • 4R-ARB Sri Lankan Airlines Air Taxi, Colombo, Sri Lanka. Regd Apr-2005. • C-FJHA Harbour Air Seaplanes Ltd., Richmond, BC. Regd 07-Oct-2007 & 02-Nov-2007. Otter 393 was delivered to the RCAF on 31st October 1960 with serial 9415. It was allocated to 402 Squadron, Winnipeg and moved in January 1961 to 406 Squadron, Saskatoon. It suffered minor damage on 7th March 1963, a cut in the underside of the wing caused by the hand turning of the propeller on a nearby Beech Expeditor. In March '64 the Otter returned to 402 Squadron, Winnipeg. In October '65 the Otter was withdrawn from the squadron, allocated as a spare aircraft for service with 117 Air Transport Unit (ATU) in Pakistan, and the squadron received Otter 3683 (44) as a replacement. 9415 was flown to Trenton where, with two other Otters also allocated as spares (9404 and 9426), it was painted all white and stored in a hangar, ready for immediate dispatch to 117 ATU if required. 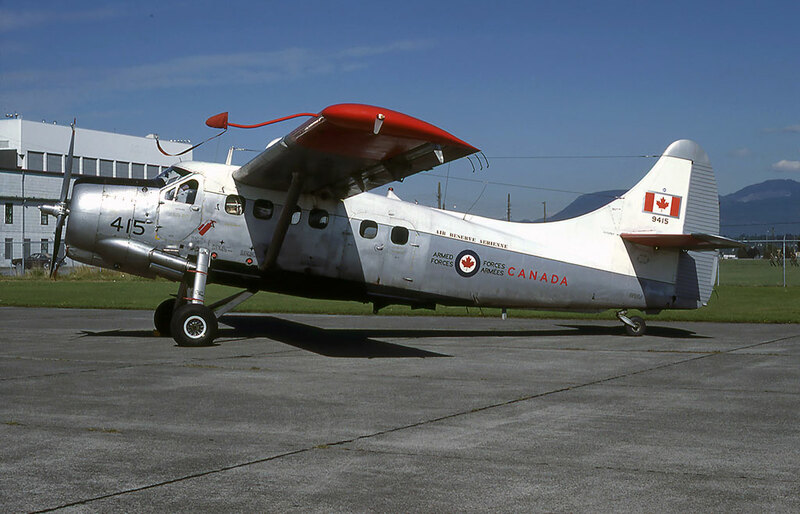 In the event, none of the three spares were required, and during January/February 1966, 9415 was painted back into full RCAF colours by 12 TSU at DHC Downsview. 9415 was then assigned to 411 Squadron, Downsview which it joined on 17th February 1966. On 22nd October 1966 it was involved in a landing accident at Buttonville Airport, Toronto. On touchdown after a full flap approach, the right wing rose. Corrective action was ineffective, the left wing tip touched the ground, the Otter yawed to the left, the tail rose and the aircraft came to rest off the runway in a nose-down attitude. The pilot had used full flap while landing in a strong gusty wind. As well as the left wing tip, there was also damage to the propeller and undercarriage. It was soon fixed however and 9415 returned to service with 411 Squadron where it was to continue to serve for the remainder of its military career. 9415 was to fly for 411 Squadron for fifteen years. It is mentioned several times in the unit's history. On 26th August 1975 it is recorded as having dropped the Skyhawks parachute team 40 times over Port Colborne as they were fine-tuning their routine. In the summer of 1977, Otters 9415 and 9423 flew up to Spence Bay, Northwest Territories to provide re-supply for Army engineers who were building a new runway. A Hercules of Buffalo aircraft would deliver supplies to Shepherd Bay and the Otters would in turn deliver them to Spence Bay. As the history records “Some loads, like the replacement bulldozer blades, were heavy and although the cabin was still nearly empty after loading, the Otter struggled to get off the ground. Each aircraft operated from rough strips for the two month away from base, with no significant down-time. This compared favourably with the numerous breakdowns the Buffalo experienced on its trips from Trenton to Shepherd Bay”. It certainly was a comprehensive tour. 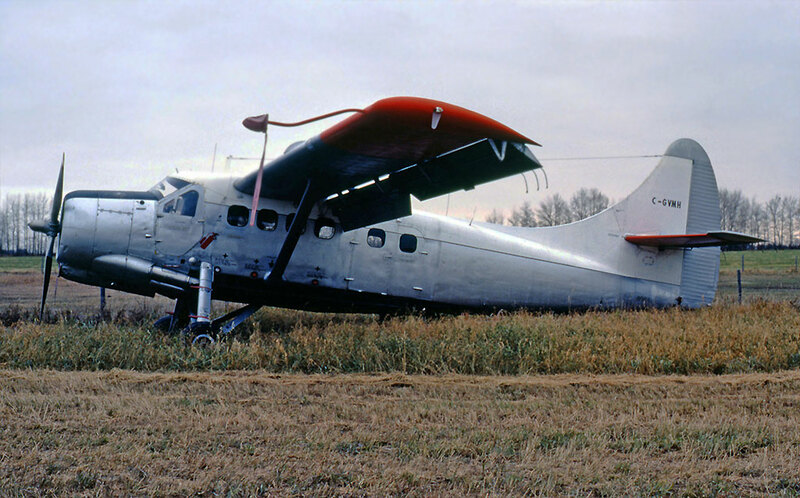 As the Ottawa Citizen newspaper, reporting from Vancouver, wrote: “Otter 9415 sounds like a cross between a deafening lawn-mower and a sewing machine, but after roaring down the airstrip at Vancouver International Airport, the single-engined airplane soared into the sky as light as a feather. The 29 year old aircraft is the last of a line of old war-horses being disposed of in favour of helicopters by Canada's Air Reserve. The aircraft was on a last, emotional tour of the country it helped develop”. After its return from the tour, 9415 continued flying from Downsview until 3rd December 1981, when it was ferried to Mountain View and put into storage. It was one of a number of Otters sold by the Crown Assets Disposal Corporation at auction in September 1982, advertised as having 7,971 hours total time on the airframe. The buyer was Mike Hackman Aircraft Sales of Edmonton, at a price of $56,511 Canadian. It was registered to Mike Hackman Aircraft Sales Ltd., on 22nd November 1982 as C-GVMH and on 25th November a ferry permit was issued for a flight from Belleville, Ontario to Edmonton. After overhaul, on 15th June 1983 the Otter was registered to Estabrook Construction Ltd., of Grimshaw, Alberta, its total time then being 7,994, an increase of 23 hours since it was auctioned at Mountain View. It flew for Estabrook Construction (a company associated with King's Construction Ltd., of Grimshaw, who had Otter C-GVMO) until June 1984. 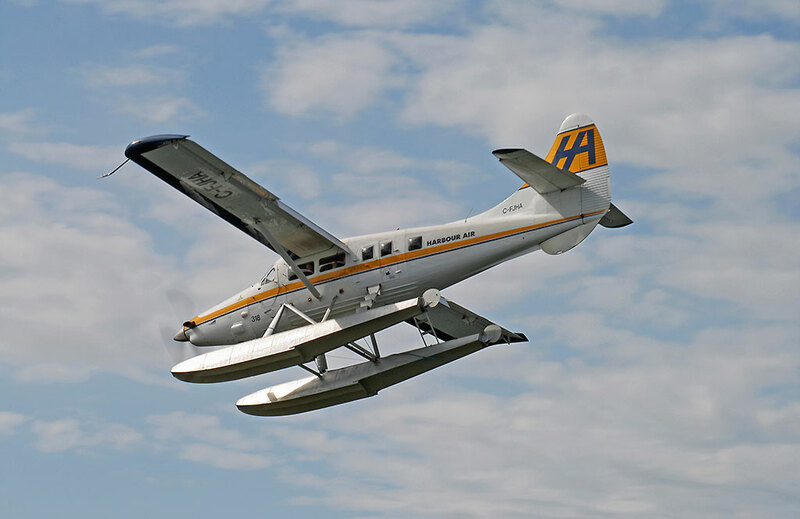 By Bill of Sale dated 26th June 1984 the Otter was sold back to Mike Hackman Aircraft Sales Ltd., to whom it was again registered and on 24th October 1984 it was sold on to Hub Air Service Inc., of McGrath, Alaska to whom it was registered N61LC. After nearly three years with Hub Air Service, which also flew Beaver N62LC and some Pipers and Cessnas, the Otter was sold to David A. Werner, trading as Diamond Aviation of Wrangell, Alaska, to whom it was registered in August 1987. N61LC was based at Wrangell and used to re-supply a gold mine, as already described in relation to Otter 139. N61LC was Diamond Aviation's first Otter, acquired to replace a Norseman which had crashed, but the Otter alas did not last too long either. It came to grief on 22nd November 1987, fifty five miles north east of Wrangell. The pilot was on a VFR flight from Wrangell to the Skyline Mine landing strip on Johnny Mountain, BC. In preparation for landing, the pilot reduced the aircraft's speed to about 85 mph and extended the flaps to thirty degrees. On final approach, the pilot was distracted while observing fresh animal tracks in the snow below, and did not notice that the aircraft's angle of descent was getting steeper and that the airspeed was decreasing. When the pilot recognized what was happening, he applied power and pumped the flap handle, thinking he was raising the flaps. However, as the flap selector was down, he inadvertently lowered the flaps even more. The increased drag from the lowered flaps prevented the aircraft from recovering, and it struck the ground short of the runway. The landing gear collapsed and N61LC was substantially damaged. The following month it was replaced in service with Diamond Aviation by Otter N55CX (139), until it too 'came a cropper' in July 1988 and was in turn replaced by N4683K (30). 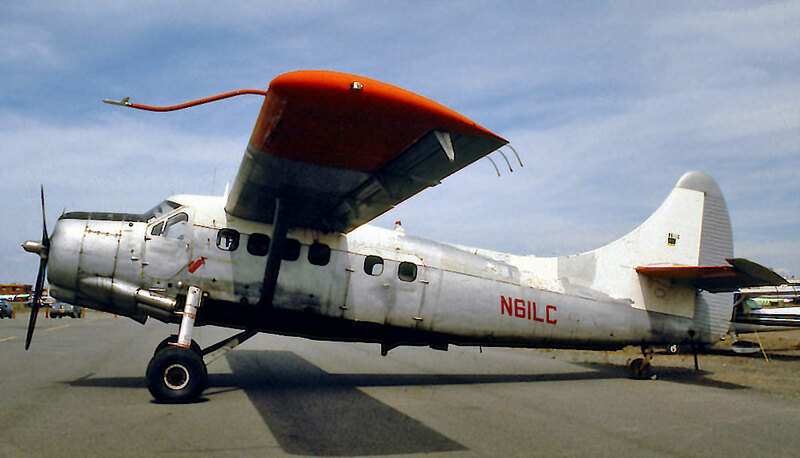 N61LC was retrieved from the mountains and taken to the facility of Viking Air Ltd., at Victoria, BC on Vancouver Island, where it was intended to convert the Otter to turbine power. This programme was proceeding slowly, and the Otter lay in storage at Victoria for many years. In October 1995 it was joined by Otter N8510T (307), intended for conversion as the second Viking Turbo Otter. Unfortunately, both Otters were damaged in December 1996 when the roof of the hangar they were in at Victoria collapsed under a weight of snow. The following year, work commenced on repairing both Otters and on converting 393 as the prototype Viking Turbo Otter. At this stage of its career, 393 had total airframe time of 8,963 hours. This work also proceeded slowly, but on 22nd March 2001 the Otter was registered to 524085 BC Ltd., of Victoria, BC as C-GVTO, the last three letters of the registration standing for Viking Turbo Otter. It made its first flight as a turbine on 9th May 2002, and development flying continued towards certification of the conversion. C-GVTO was the centre-piece of the DHC Out-of-Production Aircraft Conference held by Viking Air at Victoria 18 to 20 October 2002, which also celebrated the Otter's 50th anniversary. VTO was painted in an all white scheme but carried Air Wemindji titles, a sale to that company being intended subject to certification being obtained of the turbo conversion. It was intended that Air Wemindji's Otter C-FKLC (255) be traded in to Air Viking in part exchange. 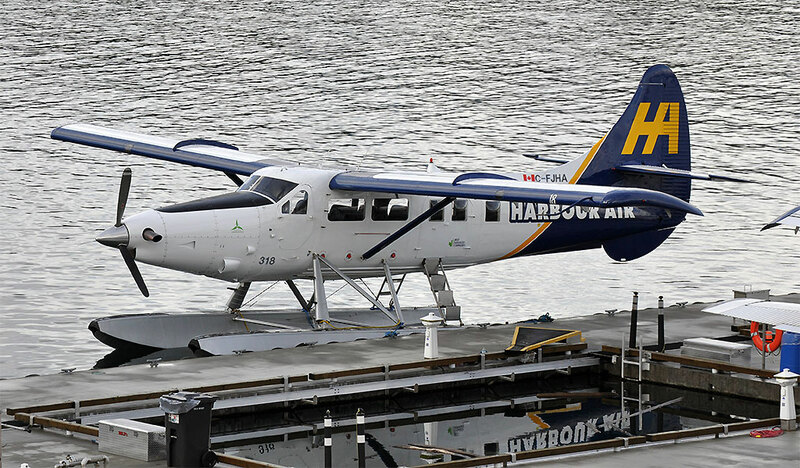 In the event, after the Conference was over, the Viking turbo Otter project was put on hold due to other business pressures and VTO was put into store at Victoria. Here it remained until early 2004, when Viking Air obtained a contract to supply two turbine Otters to Trans Maldivian Airways (TMA) in the Maldives. 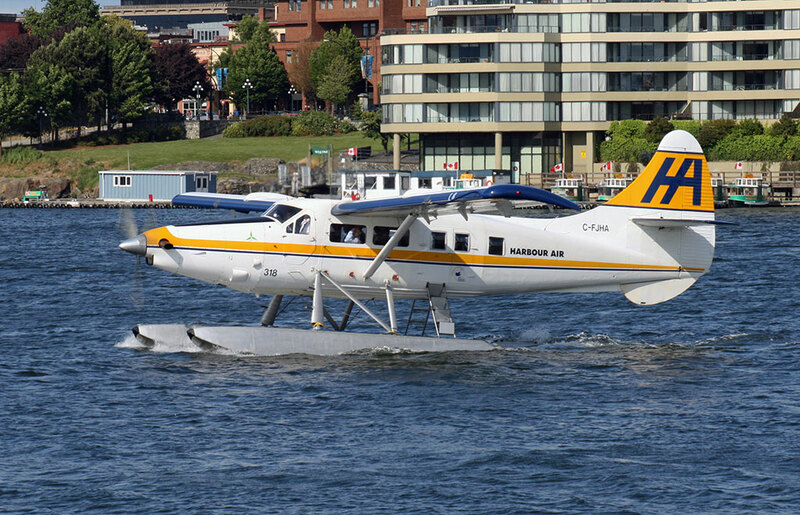 Viking purchased Otter C-FJUH (214) from Propair in Québec, which was flown to Victoria. Here, JUH and VTO were converted to Vazar turbines, painted in TMA's colour scheme and were then crated and shipped to the Maldives. JUH arrived first, was registered 8Q-TMZ and entered service with TMA, whose operations have already been described in relation to number 214. VTO was cancelled from the Canadian register on 30th April 2004, but only arrived in Male, the capital of the Maldives, after the long sea journey, in mid August. By that stage, TMA had decided that in fact they would stick with their Twin Otter fleet, and no longer wanted the two Single Otters, which they were negotiating to sell. A buyer was found almost immediately in the shape of Sri Lankan Air Taxi, based at Colombo in Sri Lanka. The company was a subsidiary of the national carrier, Sri Lankan Airlines, which had been formed the previous year to operate domestic air services and charters, and which had started operations with a Cessna Caravan. The purchase of the two Otters was announced in August, and they were shipped to Colombo, re-assembled and registered to Sri Lankan Air Taxi in October 2004, 214 as 4R-ARA and 393 as 4R-ARB. 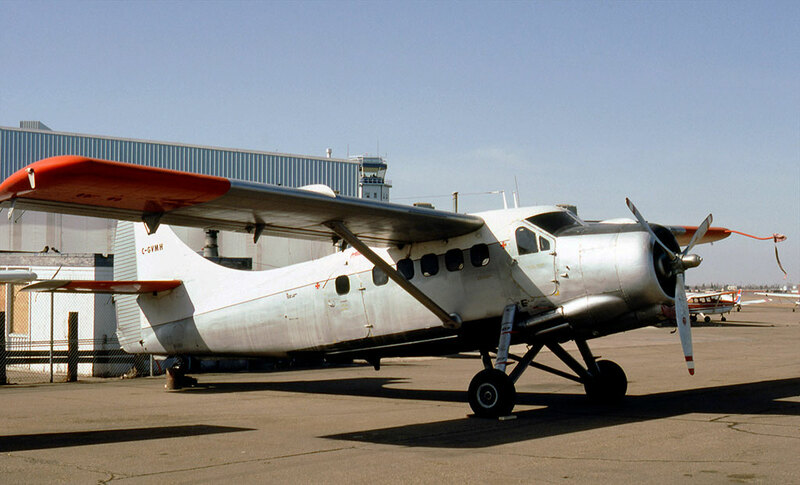 Both Otters entered service alongside the Cessna Caravan, as explained in relation to number 214. 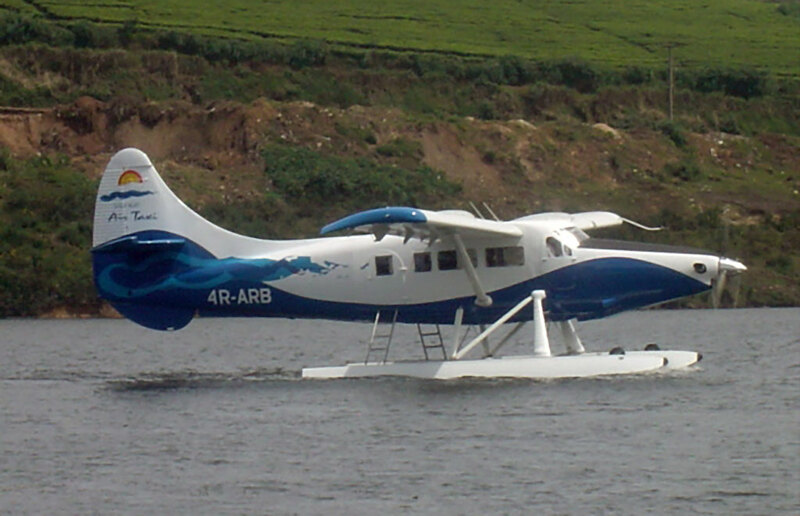 Also as mentioned in relation to 214, after the tsunami (tidal wave) disaster which struck Sri Lanka on 26th December 2004, the two Otters were used during January 2005 on the relief effort, 4R-ARA flying as a wheel plane and 4R-ARB on amphibious floats. Serving with Harbour Air as C-FJHA. f/n 318. The two Otters continued in service for nearly three years but due to the declining security situation within the country (with frequent attacks by ‘Tamil Tiger’ insurgents) many of the destinations served had to be abandoned and this, together with the declining number of tourists visiting the country, rendered the operation no longer viable. Sri Lanka Airlines decided to close down the air taxi operation, with the last flight operating on 5 June 2007. On the very last flight that day 4R-ARB received some minor damage in an incident. 4R-ARB, on amphibious floats, operating flight UL5302, took off from its base at Colombo-Ratmalana Airport for Konduwatuwana water aerodrome, to pick up passengers to return them to Colombo. After a one hour flight the pilot made his approach to Colombo Airport’s runway 22. He forgot to extend the landing gear and the Otter landed on the runway on its floats. There were no injuries and the only damage was to the lower skin structure of the floats. The accident report found that the pilot was in a state of chronic fatigue due to the decision to close down Sri Lanka Air Taxi, thus losing him his employment. Both Otters were withdrawn from use at Colombo and put up for sale. The advert for 4R-ARB (393) was dated 20 June 2007 and gave the airframe time as 10,500 hours. The PT6A-34 engine had 1,800 hours since major overhaul. 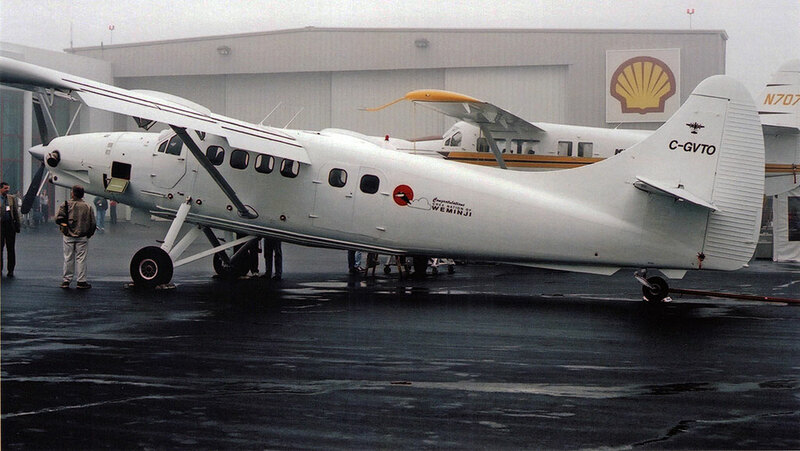 The aircraft was on EDO7490 amphibious floats and had 16 interior seats, and Vista Large Bubble windows. 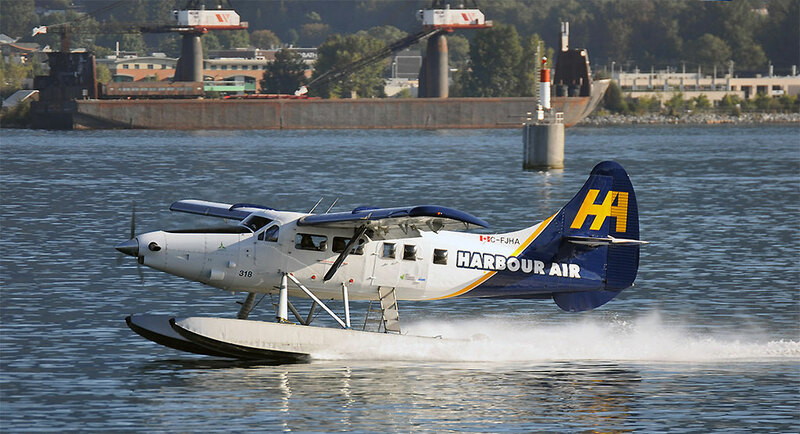 Both Otters were sold to Harbour Air of Vancouver, becoming the company’s 17th and 18th turbine Otters. Both aircraft arrived at Vancouver in four large crates on 31 October 2007, having been shipped from Colombo. Otter 393 was registered to Harbour Air as C-FJHA on 3 October 2007. 6 October 2014. JHA at Victoria Harbour taxying for departure. Struck a seagull with the propeller and returned to the dock for damage assessment, after which it resumed service. 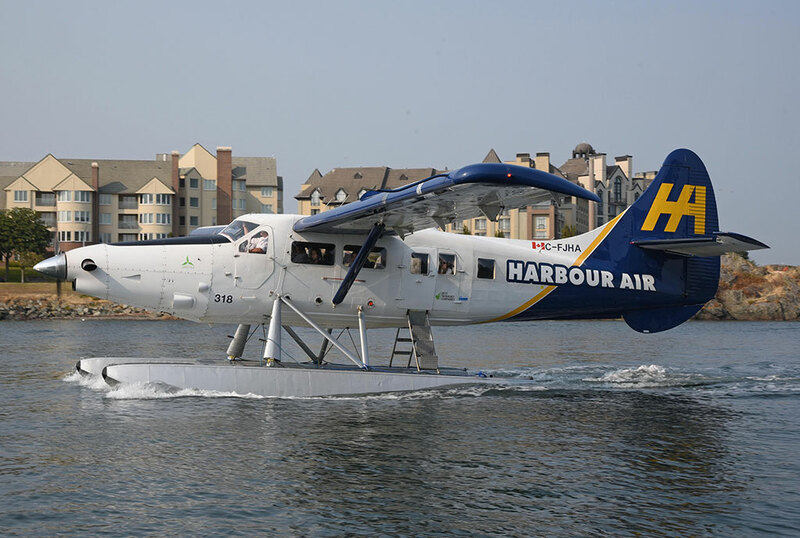 Over the winter of 2015 / 2016 the Otter was re-painted into Harbour Air’s new blue and white scheme. 4 April 2016. JHA five miles north of Victoria. Air Canada Jazz DHC-8 C-FACF on flight JZA77 Vancouver to Victoria reported TCAS conflict with the Otter and climbed 200 feet. The Otter was en route from Victoria Harbour to Vancouver Harbour, 500 feet lower than the Dash 8 on a parallel track. 13 August 2017. Missed approach by JHA due to a vessel entering Landing Area A at the Victoria water aerodrome. 5 September 2017. 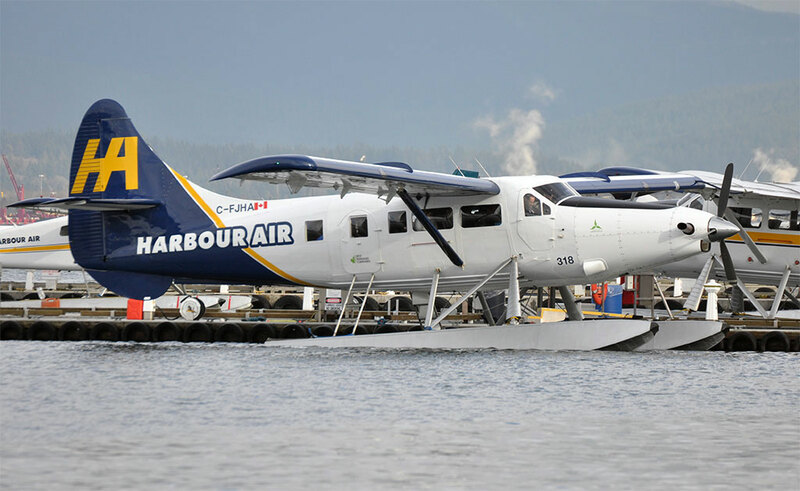 JHA from Pitt Meadows to Victoria Harbour, this being a new Harbour Air scheduled service, from the Fraser River at Pitt Meadows to Victoria Harbour. The Otter struck a number of sparrows on approach but landed safely.